Today we are back with the Monday Mysteries after some time spent doing much needed website maintenance. This mystery photo has some clues as to the location in the picture. I will leave it to you to decipher. 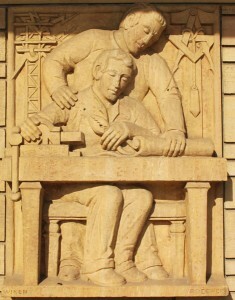 The building on which the sculpture is located lies in the area of downtown west of the river. I’ll wait to see if anyone can guess it before giving out more clues. 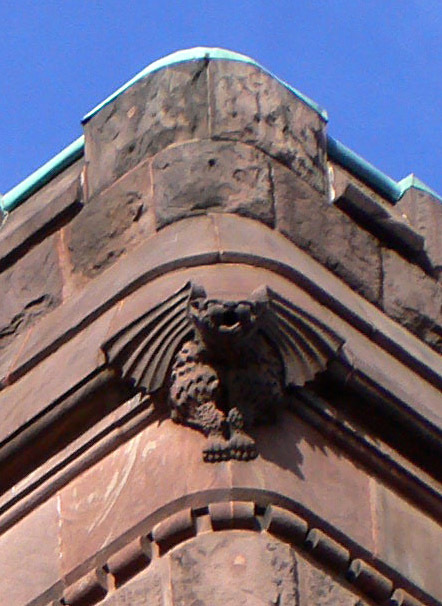 Start your week off right by trying to guess which building the gargoyle sits atop. The clues for this little guy is a church right on the edge of downtown. Other clues can be found in the picture if you are a good detective! I am almost at that point where I have exhausted the interesting faces on downtown buildings so it is time to start moving to other areas of the city. Hopefully some of you may be able to more easily identify these buildings! 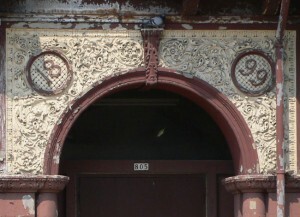 This near south-side building in the Fifth ward was built in 1899 as the picture shows with this fancy stone scrollwork above the entrance. This design does not have a face but it is distinctive enough that some of you may have noticed it. This is on a major thoroughfare and an extra clue will be the last few symbols in this paragraph. Where is this building located ?????? Today’s mystery figure/face is on a well known east side building (not east side of downtown). This picture depicts a coal miner which had significance for the original owner of the building. Who can be the first to guess the building and where it is located?? 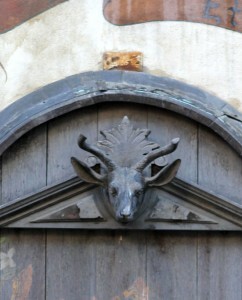 The stag head shown below sits above the entrance to a popular East Town restaurant. Who will be the first to guess where this mystery face is located? 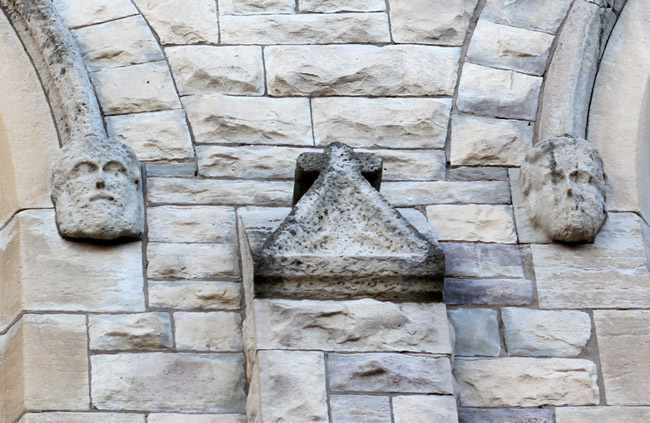 Today’s mystery are a pair of faces on a downtown church. The faces have been around for nearly 150 years so they have seen many Milwaukee changes. They have managed to survive a fire in the early days of the church which gutted the building. Who knows the church where these faces live? Happy New Year, fans and friends! The first mystery of the year takes us back to a 19th century building in the east town neighborhood of downtown. 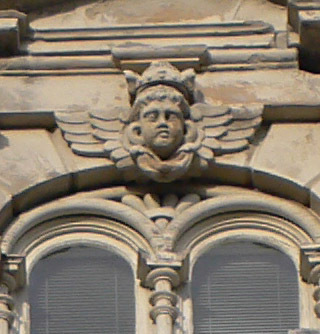 At the top of this building is a ring of winged cherubs cavorting. Try to say that five times fast! Who can guess which well-known building this week’s mystery is on? I know that everyone has been breathlessly awaiting this all day so here it is! It is the post-Christmas Monday Mystery. This could be easy. 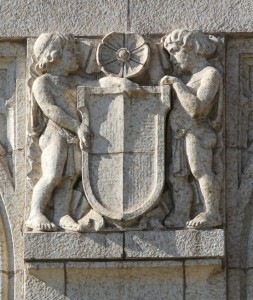 It is on a downtown building and portrays justice with her scales. 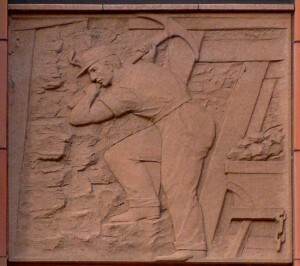 On which building can this be found? 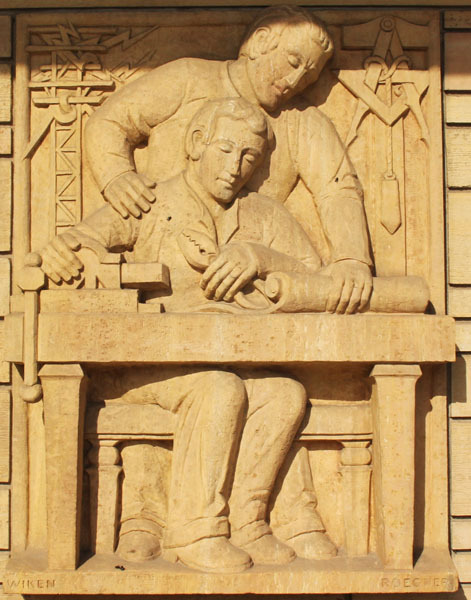 Today’s Mystery photo is somewhat related to the story posted on Saturday and is on a building just to the west of downtown. This building has lots of interesting terra cotta, especially these two little figures. Where is this building located?